For Syncro System, the process of upfitting vans goes beyond merely installing equipment and accessories. The Syncro group strives to make sure that every customer is completely satisfied, which includes the designing and building of personalized systems to fit individual needs. Adept management at every level of the company, from the production chain, to commercialization, to sales must be based in effective and efficient organization. That expertise goes hand in hand with years of experience (already more than 15 years in the sector), since 1996, Syncro System has been exclusively upfitting vans. 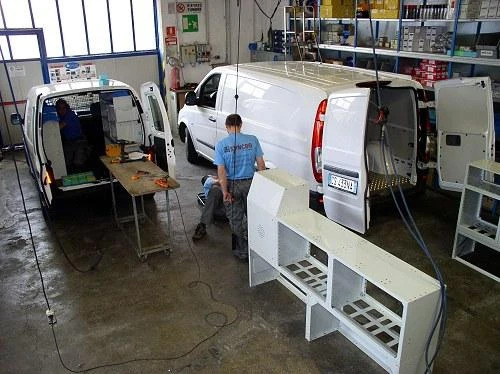 If you need to upfit your van, you can contact us by: calling our toll-free number 800 189596, filling out our on-line form on our site: Contact Forms, sending us an e-mail , visiting one of our Syncro System locations . The first step in turning your upfitted van idea into a reality is speaking with a specialized Syncro System's technician. During the initial consultation, the technician takes into account the needs of the client and the dimensions of the van in order to design a project, choosing the ideal equipment and accessories to best fit the project. The project is then drawn up and the necessary components are ordered. All designs can be fully customized to meet the specific needs of individual clients. 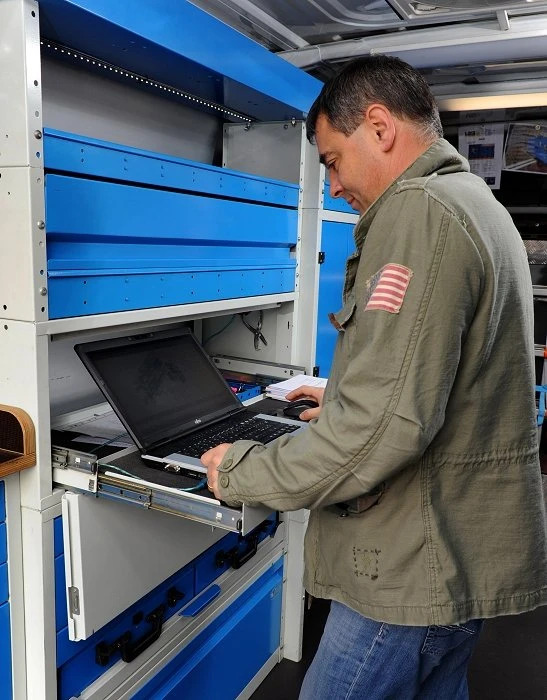 At this point, the project is turned over to expert personnel for installation, starting with the panels and liners and moving on to anchoring equipment (storage modules, drawers and shelves , work benches ), accessories and utility and ladder racks . Even at this stage in the realization of the project, the client can ask for modifications to be made: substituting or moving equipment, adding others or accessories. Every one of Synco's branches has a fully-stocked warehouse with every item found in the Synco Sytem catalog, so that last minute alterations can be done easily and in almost no extra time at all. To help their clients resolve problems that might come up related to the installation of the seperate components, the technicians at Syncro System continue to provide support and assistance even after the the upfitting is complete. It is their job to explain how all the equipment and accessories function, as well as to substitute any products that need to be replaced due to changing regulations. All Syncro System products and materials are covered by a three-year guarantee, backed by the trademark CE and by the optional saftey certificate GS (saftey tested).